So I’ve got to share some news. Not Turtleduck Press news — these are other people’s books I’m talking about. I’m excited about them and hope you will be, too. Out now. 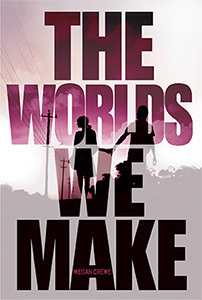 This is the third book in her YA apocalyptic trilogy. In her world, society is brought to its knees by an influenza epidemic, leaving Kaelyn struggling to do the right thing, or even to know what the right thing is. It’s a quieter, more reflective series than is usual in this genre. I’ve read the first two books and can’t wait to read the finale. Out in April. Monette is one of my very favourite authors. Last year I read a book she co-wrote with Elizabeth Bear, and loved it so much that I promptly flipped back to the beginning and read it again. 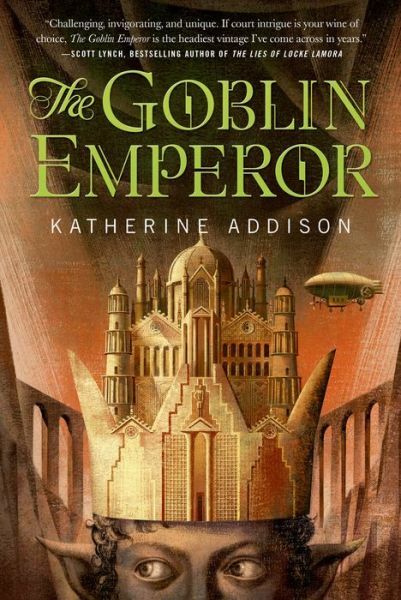 The Goblin Emperor has been listed on her Wikipedia page as “forthcoming” for years. I’m beyond thrilled that it’s finally (almost) here. Your turn! What recent or upcoming books are you excited about? Writing continues to chug along. I’ve hit 3.5 hours for the second week in a row, meaning I’m on track to hit 14 hours this month. It’s not a lot, but it’s more than I’ve done in a month since November and also more consistent than I’ve been since then, so go me! This is my second week working on a novel edit that got shelved mid-draft, so I’m starting to dig deeper into the material. It’s only the second draft and I’m a pantser, so there’s a lot of digging still to go. I can only hope I’m getting somewhere…. This week I’m setting the bar a little higher and aiming for 4 hours. Also, this is not exactly about renovations, but we’ve used the newly set up exercise room most days this week. Go us! Right about this time of year, I always start to feel really ground down by winter. Christmas holidays are a distant memory, the February long weekend (Family Day in most of Canada) is over, and the Easter long weekend isn’t for another month or two. Post-holiday optimism and resolve have been dulled by the pressures of reality. The cold grey weather seems like it’ll never end, and I’m more than ready for some warmth and sunshine. And yes, I’m taking Vitamin D and I’ve tried full-spectrum lights in the past. Last year I even contrived to run away to a hot climate for three months, but that’s not an option this year. Here’s something I wrote almost exactly two years ago: Surviving the End of Winter. Unfortunately, those strategies aren’t working so well this time. (Even the copious amounts of chocolate.) Mental health is a moving target, I swear. So I’m turning the platform over to you. How do you cope with the late-winter blues? Despite the above, I’ve already hit 2.25 hours of novel revision this week — thanks in part to the aforementioned long weekend, and in part to having to prep pages for my critique group. Only another 1.25 hours to go! Jury’s still out on whether I’m actually making progress or stalled, though. Maybe the rest of the week will see things start to move along. Blogging regularly is good discipline. I’ve managed a regular schedule for pretty much two years now. Given how my fiction writing schedule goes (or doesn’t), that’s not peanuts. I can’t think short. Blogging is time-consuming, and depending on who you listen to, it might be time better spent working on fiction. I’ve tried to write shorter posts to decrease the time commitment while maintaining the same schedule, and it just doesn’t work. I think long, and that’s all there is to it. Comments make all the difference. Blogging can sometimes feel like shouting into the ether. It’s a relief when someone steps up to say “Hey, I hear you!” — either in so many words, or with a simple “like”. Thank you all for being here! This blog is all over the place. Travel blog? Geekery, feminism, and the intersection of the two? Personal journey and mental health? Writing? Yes! (And more.) It may not be the best for platform or building a coherent audience, but it does keep me entertained. 10. Book Nostalgia: Trixie Belden. Trixie was one of my favourite characters growing up, but I worried when I wrote this post that she would be too niche to garner any interest. Guess I was wrong! 9. Into the Jungle at Taman Negara. A travel post about Malaysia. In this case, I think the popularity stems from the relative lack of other posts on the topic…but I hope the enthusiasm of the writing (it was my first time in a jungle!) and photography encourage readers to look around a bit while they’re here. 7. Book Nostalgia: The Time Quartet by Madeleine L’Engle. Here’s another “book nostalgia” post about a series that was one of my very favourites growing up. 6. Book Nostalgia: Anne of Green Gables by L.M. Montgomery. And another one! 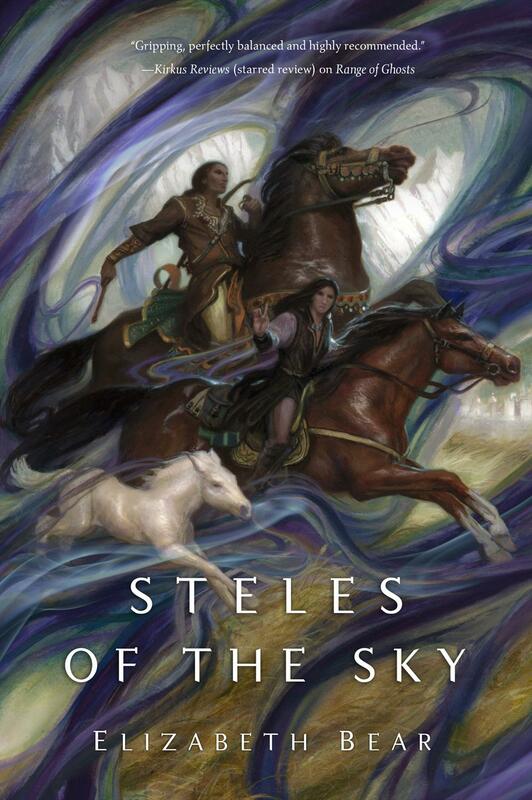 I haven’t done any Nostalgia posts lately because I haven’t been rereading, and it’s difficult to blog coherently about books I haven’t read in years. But their popularity has me thinking maybe I should revisit the topic…. 5. Pacific Rim Analysis: Is Mako a Strong Female Character? Like I said, feminism and geekery are topics that fascinate me, and clearly I’m far from the only one. This is the most recent post on the Top 10 list, from August 2013. 4. Exploring the Cameron Highlands in Malaysia. This is my only other travel post to have hit the Top 10 so far (though “Guide to Train Travel in India” is sitting at #11), which is funny because I feel like the travel posts are often my strongest. If you liked this one and/or #9, have a peek at some of the others! 2. 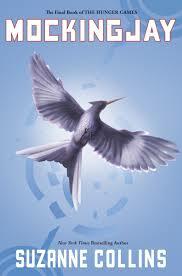 Book vs. Movie: The Hunger Games. Again, super-popular film and super-popular book made for a lot of hits…which made me happy because I really enjoyed unleashing my (not-so-inner) geek to write this. I wrote one for Catching Fire too, but for whatever reason, not as many people are Googling that. 1. 7 Writing Lessons from George R.R. Martin. To be fair, this one gets a fair number of false positives — hits from people looking for writing advice from GRRM, or writing lessons given by GRRM. Be that as it may, I’m still pretty proud of how it turned out. The first two years have been a journey for sure. Hope you’ll join me as we enter the Terrible Twos and beyond! Your turn! If you track your blog stats, what have you learned from them? Or do you deliberately avoid looking at them? Here’s a Sunday check-in for a change! Quick recap: in my last check-in, I spoke about being frustrated that renovations were taking too much time, and I decided to raise my weekly goal from 3 to 3.5 hours (down from the 5-hour goal I declared at the start of ROW80 and then kept missing). Turns out that was a good plan. (I’ve used the same goal in the past and found it works well, simply because it’s so easy to track — no tricky math.) Last week I hit 3 hours for the first time since starting the challenge. This week I’ve hit 3.5 hours. My unofficial goal for February has been 14 hours (half an hour per day — averaged out because I don’t write every single day) and I’m completely on track for that. Go me! Another component of my original ROW80 goals was to write in bigger chunks. That’s been kind of patchy — half an hour a day is all I can manage most days — but I have done two 2-hour days in February so far, and today’s writing included a 1.5 hour session. So I’m successfully starting to train myself to go for longer. As for the actual writing, I’ve finally abandoned a flash fiction piece that wasn’t working, after spending way too long trying to make it work (story of my writing life). Instead I’m going back to a novel edit that got shelved mid-draft. I’d really like to finish it and get it out there. That won’t happen by the end of this ROW80, but I’m aiming for sometime this year. I can’t be more specific because this is the first novel I’ve gotten this far with, so I’m still working out my process. Wish me luck…. So things are starting to come together, finally. We do still have the kitchen to tackle, which will be a huge job. The first step is clearing out the junk that’s accumulated in that room, then cleaning, then getting stuff for it — taking what my MIL isn’t using, and buying all the things to fill in the gaps. Whew. I’m reminding myself that all of this is part of Project: Making Space and it will all make my life better in the long run. In the meantime, I’ll be hiding behind my computer, shooting to get another 3.5 hours closer to having a finished novel. This week I’m back to travel blogging. 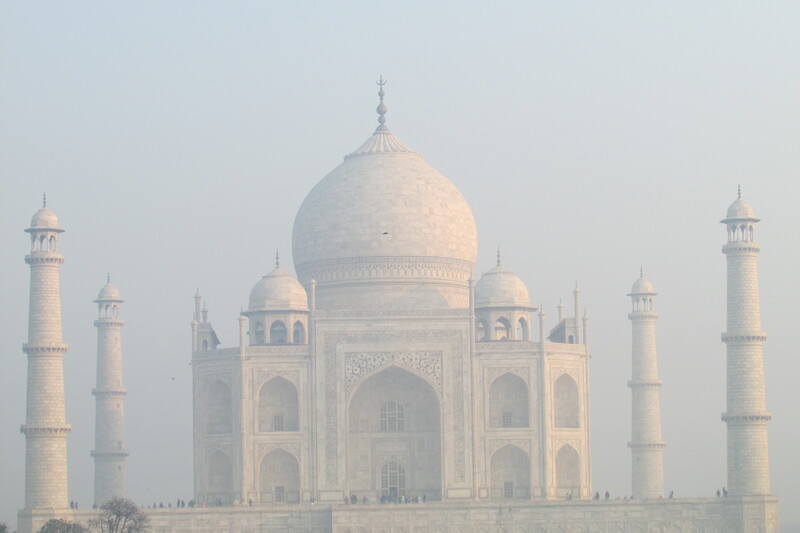 I’d like to tell you about one of the most amazing experiences from my three months in Asia — visiting the Taj Mahal. You wake to darkness, well before dawn. The rickshaw driver you hired yesterday, a small imp of a man named Shabbu, told you that dawn was the best time to go. So here you are, getting dressed in the dark and stumbling downstairs in the pitch-black guesthouse because the power is out, again. It’s February and cold. You’re wearing all your clothes. Shabbu drives you through streets empty of traffic, but not of people. Early-rising locals drift through the predawn mists, wrapped in odds and ends of shawls. There is an echoing absence of sound, of the constant honking you’ve grown to expect in your short time in India. It looks like the apocalypse. Shabbu lets you out near the great walls that surround the gardens. 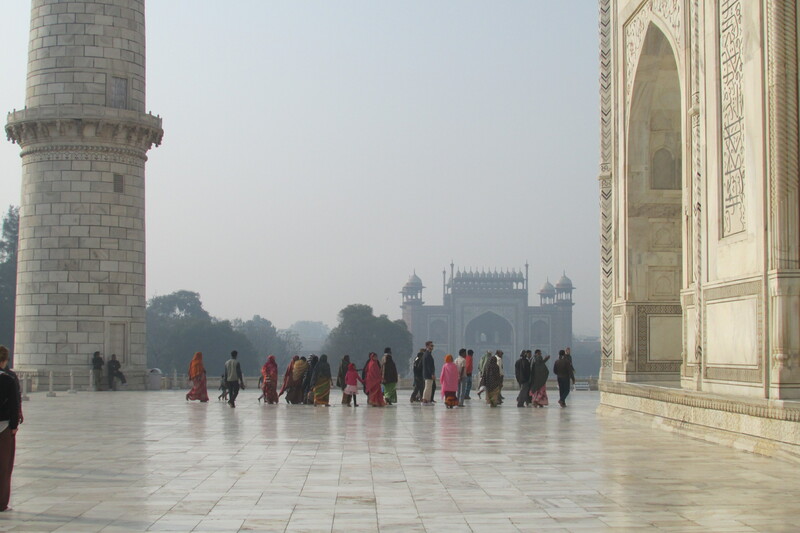 You cannot see the Taj Mahal beyond, only the lineup, other foreigners waiting. The line is long and dawn is coming. You start to worry about missing the moment of greatest beauty. Finally you reach the head of the line. There is a security patdown — segregated by gender — and then a scanner for your bags. You have your small laptop with you, unwilling to leave it in your room at the guesthouse. They explain you can’t bring it in. Only the camera. There are lockers down the road. You’re turned away. You panic. Stress turns to tears. But you go, as you must. The lockers are guarded, after a fashion, and you leave the bag because there is nothing else to be done. Back at the gates, the lineup has dissipated, everyone already inside. 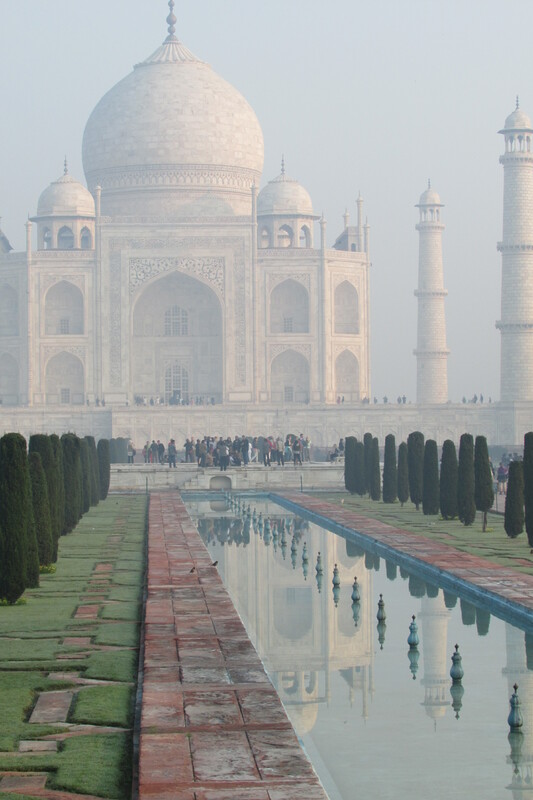 You push through, cross the outer courtyard, pass through the immense gatehouse, and catch your first sight of the Taj Mahal. It emerges from the dawn mist, pearly pink and ethereal, almost shimmering. You lose all your words. You’ve rented an audioguide but you can’t listen, eventually turning it off. All you can do is drift closer, speechless, eyes fixed on the most perfect, beautiful, glorious building you’ve ever seen. There are other people around, other buildings in the complex, reflecting pools along the long straight path from the gatehouse, but they don’t matter. 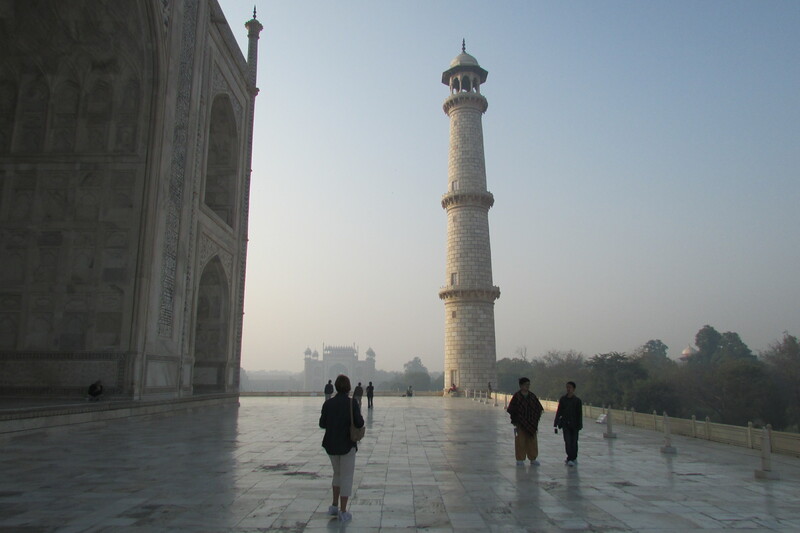 It takes you a long time to reach the Taj Mahal. You keep stopping to gaze, to take pictures. Finally you reach the base of the marble pedestal upon which it sits. You don slippers they give you to protect the marble. Up close, the building is even more beautiful. 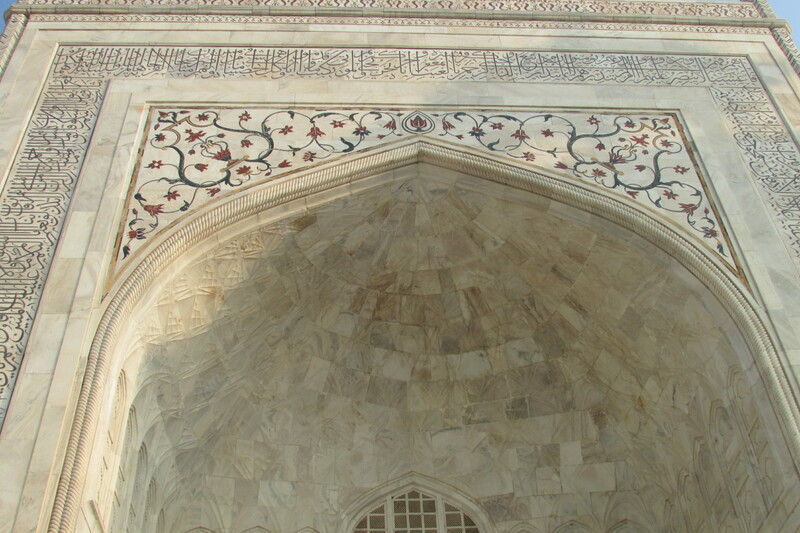 The curve of the arches is perfection itself, but now you can see that each arch is lined with Arabic writing inlaid in the very marble. You can’t imagine the level of skill required. The arches soar higher than you expected, but the building itself is smaller. It’s immediately clear that this is a tomb. The interior is a small octagonal room, full of hushed echoes. At the very centre, protected by a marble screen, sits the cenotaph or “empty tomb” of Mumtaz Mahal, the woman beloved of the emperor Shah Jahan, for whom all this was built. Outside once more, you circle the building on the marble pedestal. 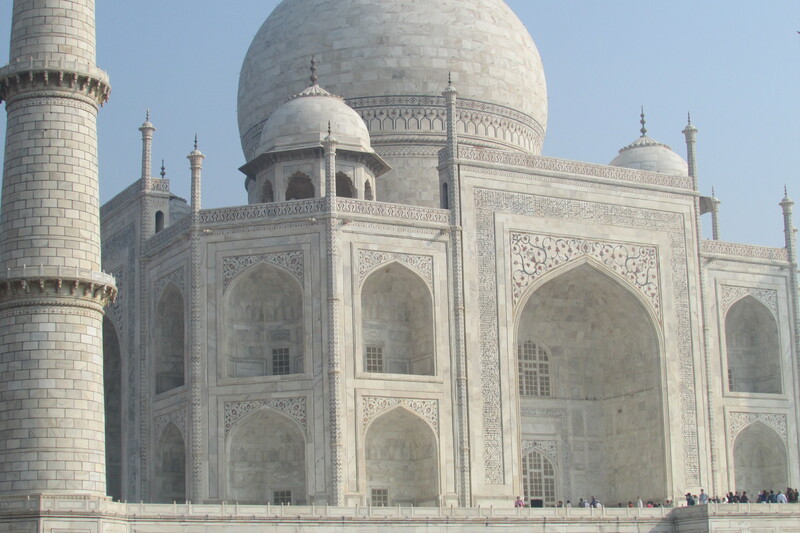 It is symmetrical, identical in all four directions, down to the slender minarets on each corner of the pedestal. 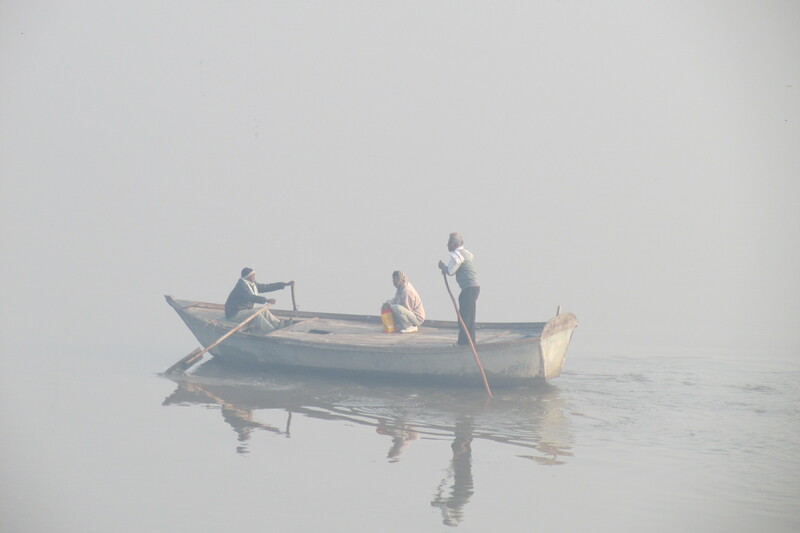 On the far side you discover the Yamuna River, still hazy with morning mist. You linger still, because now you discover something else. 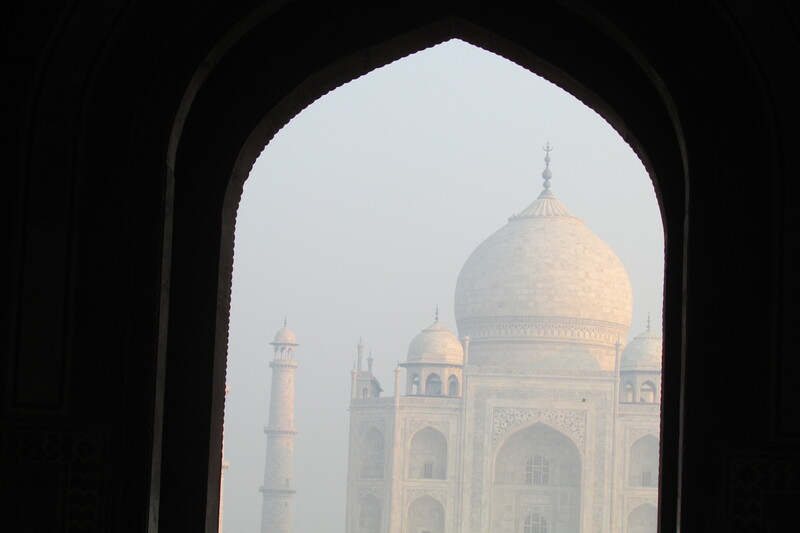 The Taj Mahal changes as the light shifts. You circle it watching the shadows in the arches, watching the marble change to golden yellow and then pure white as the sun rises overhead. The dawn crowd has dissipated and the tour buses on day trips from Delhi are arriving by the time you finally tear yourself away. You walk away slowly, still half dreaming, glancing repeatedly over your shoulder to catch a few last precious glimpses. If you liked this post, you can find more tales and photos from my travels here. Hello, all! I had an unexpected Internet outage over the weekend, and my connection was only restored yesterday. It’s good to be back. The latest installment of my fantasy serial “Still Waters Run Deep” is now posted at Turtleduck Press. In case you’ve forgotten or are new here, this is a story loosely based on Thailand. The current installment is the second-to-last one, so it’s a good time to start reading if you haven’t already. Part 1 is here. The whole thing is free…enjoy! Second, this week I’m blogging about being a late adopter, also at Turtleduck Press. There’s a good discussion happening in the comments, so please do come on over and weigh in if you have time. Once again, Real Life was seriously distracting (more about that below). I logged 2.25 hours of writing, consistent with what I’ve been doing throughout most of January. (My total for the month was just under 11 hours.) It’s really not where I want to be — so resisting that self-talk is getting harder. I need to figure out how to get self-talk working for me instead of against me. This week I’ve logged 0.5 hours so far. More tomorrow, I hope. I mentioned I had an Internet outage. That, and other technical problems tangentially related to the renos, pretty much ate the weekend…and thus, all my writing time. I’m getting really frustrated. Must find a way to write more (and stop talking about writing more). Woot woot! Renovations aren’t finished, and there’s still a lot to do, clean, choose, buy, and so on even after the renovations themselves are done, but I think now we can slow down. Which means more writing ohgodIhope. I’m also hoping to get back to doing Monday books-movies-and-media posts here on the blog, because I’m having Thoughts about things other than my own life and I’m lost without the ability to natter on about them. But in the spirit of Project: Making Space, I need to remember that blogging is an “extra” and writing fiction isn’t. So I’m upping my goal a bit and aiming for 3.5 hours this week. I’d love to hit 15 hours for February. It’s still far from where I want to be, but at least it’s headed in the right direction!